The specific mechanisms by which humans and other animals are able to discriminate between disease-causing microbes and innocuous ones in order to rapidly respond to infections have long been a mystery to scientists. But a study conducted on roundworms by biologists at UC San Diego has uncovered some important clues to finally answering that question. 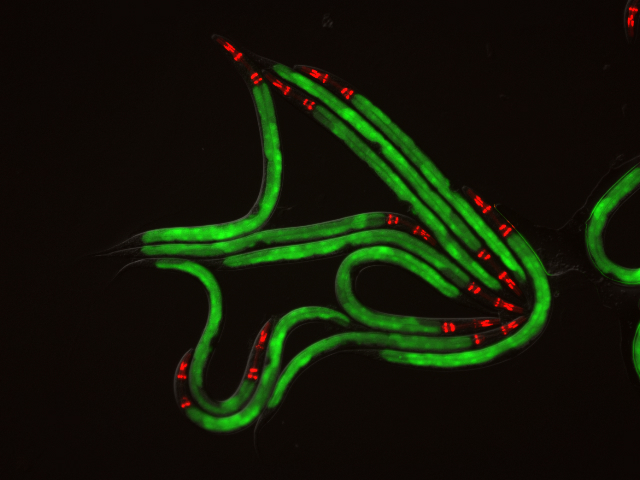 In a paper published in this week’s early online issue of the journal Cell Host & Microbe, the researchers discovered that intestinal cells in the roundworm C. elegans, which are similar in structure to those in humans, internalize bacterial toxins that inactivate several host processes. This then triggers an immune response, which results in the body mounting an immediate attack against the disease-causing microbes. The UC San Diego study and two others published this week in the journals Cell and Cell Host & Microbe by research teams headed by Frederick Ausubel and Gary Ruvkun at the Massachusetts General Hospital and the Harvard Medical School, show that the way animal cells detect an attack by poisons or disease-causing bacteria is by monitoring the function of their own cells. If those cells detect a deficit in functions, the scientists discovered, they then trigger a variety of antibacterial or antitoxin responses against the invaders. The roundworms proved to be the ideal laboratory model for these studies. Not only do they have intestinal cells that are similar in structure to human intestinal cells, but they are transparent and easy to maintain and study in lab. Troemel’s team of researchers—who included Tiffany Dunbar, Zhi Yan, Keir Balla and Margery Smelkinson—found in their experiments that a particular genetic system—the “ZIP-2 surveillance pathway”—was used by the roundworm in detecting an infection by the disease-causing bacterium Pseudomonas aeruginosa. The biologists also found that a specific toxin in the bacterium—“Exotoxin A”—blocks protein synthesis in the worm’s intestine. Troemel noted that it makes sense why animals have evolved systems that respond to core cellular dysfunction, rather than directly to specific toxins. The UC San Diego study was funded by the NIAID, Moores Cancer Center, Searle Scholars Program, Ray Thomas Edwards Foundation and David & Lucille Packard Foundation.